Intel sent me an IvyBridge Ultrabook to review, and since it runs Windows 8 and has a multi-touch screen I couldn’t wait to get my fingers on it. The book weighs in at about 3.5 pounds and has a USB-3 on either side, along with a mini-HDMI connector, a headphone jack and a hole for the power cord (which is a bit bigger than I might have hoped – the cord, not the hole!). 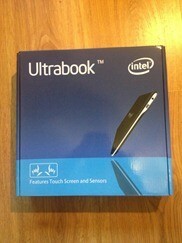 The Ultrabook has a light-sensor, magnometer and GPS as well as a gyroscope. It has a 1.5MP web-cam camera and a 5-point touch screen. The computer came with 4GB of memory and a 180GB SSD with an Intel Core i7-3667U processor (4M cache, 2.00 GHZ) which is one of the new Ivy Bridge processors. The computer came with Windows 8 Customer Preview which I immediately replaced with the RTM (which went flawlessly and fast) and then I added Visual Studio and various essential utilities (see 10 Insanely Essential Utilities That Made It To My Windows 8 Slate for a start on what I’ve added). The very first impression was favorable, though the packaging is not stunning. It is fine, it just isn’t that Apple “ooooh” experience. On the other hand, this was a pre-production machine and I’m told the production packaging will be much fancier. In any case, there were not a lot of papers (and those that were there were useful) and there were no DVDs or promotional material of any kind, all of which was appreciated. There was also included a 16GB thumbdrive with all the drivers and everything it takes to return the machine to factory conditions which was very nice. The computer itself feels substantial and has a very beautiful “rubberized” (?) top. It just looks sharp, closed or open. My only complaint so far is that the fan is loud. (I just saw Scott Hanselman’s video on the same computer, and he also complains about the fan). Windows loaded and the computer was ready to go with zero adware. Responsiveness and speed is amazing. This feels like a fast machine in a small package, and an interesting middle ground between a slate and a laptop. First test: how long from clicking on Visual Studio until it is ready to go? 2.7 seconds on my stopwatch. Not bad. Not bad at all. How about a reboot of the system: 10 seconds to the windows logo, another 8.9 seconds to the lock screen. The true test will be in the coming weeks: is this a machine I can use to develop, test and write about Windows 8 code? All in all, this machine is clearly a contender. More to come in a subsequent review once I’ve lived with it for a while. This entry was posted in Hardware, Opinion, Windows 8 and tagged Review, Ultrabook. Bookmark the permalink. Jesse when possible please post model and if can it be upgraded to 8gb ram thanks. One day people will send me free laptops. Does this laptop have a name so that we can look into buying it? What is the screen resolution? I’m not sure wha the release name is, I’ll ask. The screen resolution is 1600×900. OOps, that would be 4GB.